The 44 gallon drum stove has been doing sterling service as a pizza oven. At least every second weekend the family feasts on homemade, gluten free pizzas and keeps warm from the winter evening by sitting around the fire. 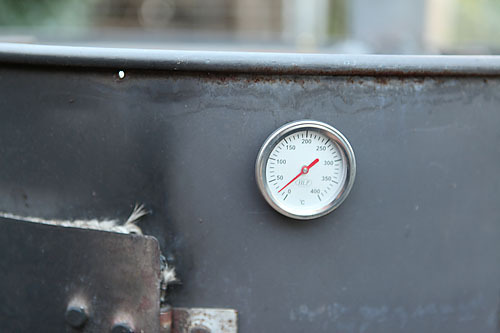 The process has been systemised and made easier by the inclusion of a thermometer. It started out with it’s probe down through the top, but is now positioned for easy viewing in the side, with the probe supported by a bolt through the top. Thermometer makes pizza cooking more predictable. 8-10 minutes @ 230 degrees C makes for a perfect pizza, hot melted topping and crispy base! The trick is to build up a good base of coals and keep the fire burning strongly. Some fire bricks for thermal mass would help, I think. To keep all this activity going we have grown the woodpile capacity too. Now several meters longer and with quite a few large logs waiting for splitting. All the wood is sourced from free supplies left on the roadside for general collection by tree fellers, council workers, fire department and householders. The freshly felled timber is tough work to split and will need to age for a year or two before burning. I figure we have a few years supply now. And the pile is nearing capacity in any case. 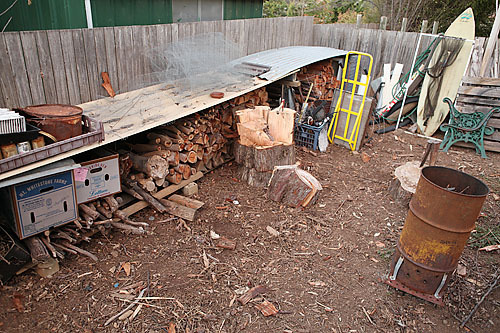 Longer woodpile, several years supply? 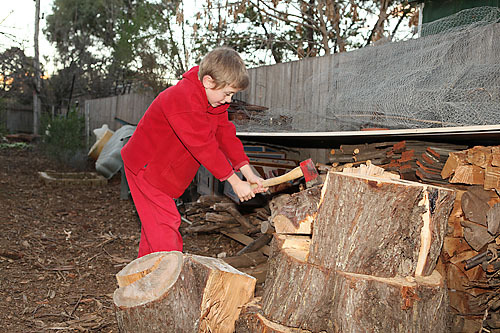 Ethan helps by chopping any errant wood chips for kindling. 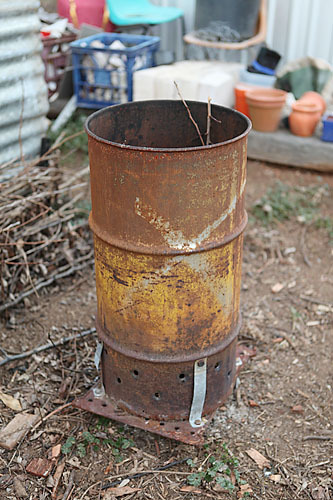 Other projects related to the fire and wood collection include a smaller fire drum for general warmth and fun, as well as burning “sticky” garden rubbish. I trialled a “bio-char” burn the other day which I read about on another blog. Filling the drum and lighting it from the top creates a fast and clean burning fire with the ash left for the compost heap. I’ve also flashed up the fire poker stick, a piece of “reo” steel, by fitting a turned pick handle piece to the end and flattening the other end a little. The original wooden handle I made split when forging the flat end by hammering the red hot reo steel. 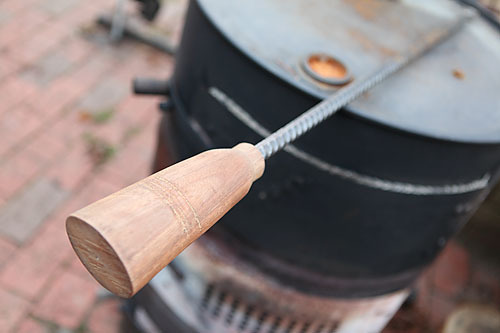 Winter is a good time to test out wood fired stoves and pizza recipes, source firewood and make stuff for the fire.